For more than ten years, he has hosted the biannual Market Outlook press conference held in various European cities. 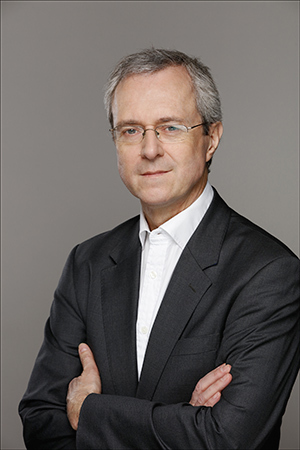 He is a regular columnist and contributor for Les Echos (FR), Le Revenu TV (FR), La Bourse et la Vie (FR), Option Finance (FR), Moneytalk/Trends (BE), De Tijd/L’Echo WebTV, Kanaal Z-Expert (BE), RTBF La Une Radio (BE), Le Jeudi (Lux), l’Agefi (Switzerland) and has made regular live appearances on CNBC US/Europe/Asia Squawk Box, Thomson Reuters TV (UK), Bloomberg TV (UK), Fondsnieuws Webcast (NL), Beleggers Belangen (NL), the Canadian Broadcasting Corp – The Lang & O’Leary Exchange and Times Group India. In addition, William has been a guest speaker at numerous conferences, summits, and roundtables. He has been keynote speaker at the World Pension Summit (Amsterdam), at the International federation of pension funds (FIAP) and the Columbian association of pension funds (ASOFONDOS) conference in Cartagena (Colombia) and a speaker or panelist at the CFA Institute European Investment Conference (FR); Edhec Risk Days (UK and US); Reuters Investment Summit (UK); Eurobond Investor Congress (UK), MoneyTalk Finance Day (BE), Morningstar Fund Summit, VFB Happening, PIPS Seminar Mercer, Finance Avenue; Fondsevent (NL); Morningstar Institutional Conference (AU); Bonds, Loans and Derivatives Brazil; Bonds, Loans, Sukuk Middle East (Dubai). He has given major interviews with international publications & newswires such as The Financial Times, FT MandateWire, Reuters, Bloomberg, IPE and Asian Investor. He also served as a panelist for the Market Outlook Roundtable of Beleggers Belangen (Netherlands), IEXProfs Magazine (Netherlands), Moneytalk (Belgium), ACPM and IMN (Canada and US).